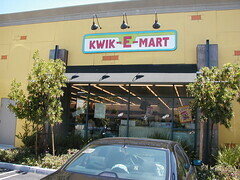 We drove down to Mountain View today to see the 7-11 turned Kwik-E-Mart in homage (or should I say marketing synergy?) to the upcoming Simpson’s movie. The big donuts with shocking pink icing were actually really tasty.